"Over the past six or seven years, Ontario has beefed up its electricity exports and made $5-$6 billion selling excess electricity, says IESO President and CEO Bruce Campbell. " 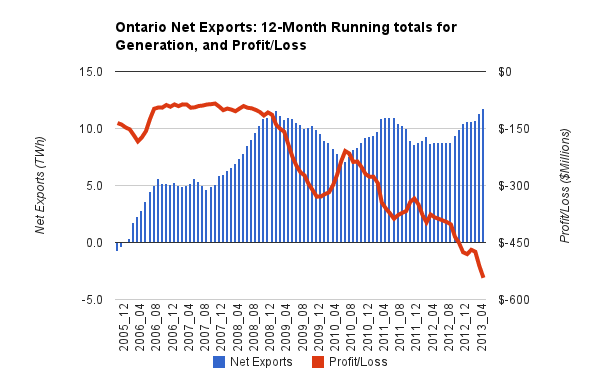 There are lots of ways to estimate profits and losses on exports, but over "the past six of seven years" Ontario doesn't even have $5-$6 billion in revenues from exports. $4-$5 billion is a revenue range for all exports since 2006 began, but most imports (particularly in the most recent years) occur while we are exporting even more, so at the most rudimentary level one might say the net revenue from export/import activities has been $2-$2.5 billion in the past 6 or 7 years. Newly crowned President and CEO Campbell is forgetting costs as, previously, Premier McGuinty, Minsiter Duguid, Minister Bentley and Minister Ciarelli have done. One has to wonder if the ability to forget things is a quality that acquires position in Ontario's ruling culture. In Ontario, consumers make up the difference between the price paid to generators, and the amount paid for that generation on the market (as estimated by the Hourly Ontario Energy Price, or HOEP) through the global adjustment mechanism (GA or GAM). As export customers don't pay the global adjustment component of the price, the average (Class B) customer in Ontario might like to see how much more customers of his class would have paid for the same amount of electricity exported. If Ontario (more logically) made ~$2 billion on net exports, it would have made ~$2 billion more selling the electricity within Ontario. The summary numbers since 2006 don't tell the relevant statistical story though. If we use the market recovery (valuation at HOEP) plus the global adjustment to estimate the full cost of generation, from 2006-2008 roughly 90% of the cost of exported generation was recovered (using the "net export" figures); by 2012-2013 this had declined to 30% of the costs being recovered. 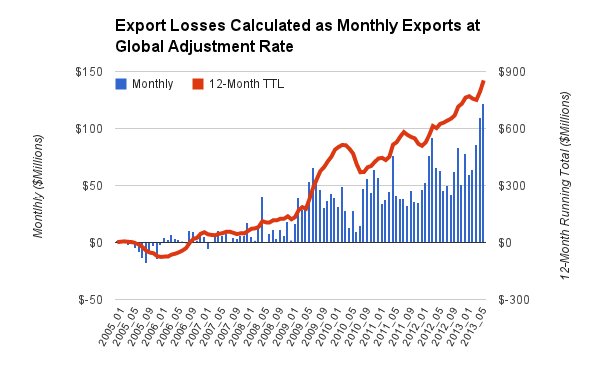 There are a couple of problems with this nice simple method of estimating the cost added to Ontario's invoices by exporting record amounts (the most recent 12 months do hold a record for net export volumes) at depressed pricing - not the least of which is that the cost of subsidizing exports is included in the global adjustment charge. A second, rapidly growing problem, is the quality of the IESO's reporting on supply, and demand, is rapidly deteriorating. While all charges (my numerator) for generation (and perhaps many other things) are included in estimates using total market demand at HOEP rates plus the bulk amount of all global adjustment classes, the amount of generation (my denominator) is not well reported as more and more solar and wind begin grabbing ratepayer dollars while embedded with local distribution companies beyond the view of the IESO. This May's record wholesale market pricing is probably a good indication we aren't raking it in on the export business. June's second estimates from the IESO indicate the May record will be shattered by over 10%. July's initial global adjustment estimate is higher than last July's global adjustment AND HOEP combined; another indicator things are now officially off the rails. In this scenario or record net export levels coinciding with record domestic pricing, the Energy Minister and Sun columnist Blizzard are brought in to see the machines that are bling at the IESO's top secret building, where the IESO's new President and CEO reportedly claims we've "made $5-$6 billion selling excess electricity." What is the appropriate position for somebody whose primarily ability is to say whatever the incumbent government wishes them to say? This appears to be the same methodology which puts the annual costs pushing $900 million with the rate of increase accelerating (monthly exports at global adjustment rate). The IESO is in charge of the smart metering data - collected from essentially every household in the province - yet they provide no indication they have a clue what generators - a much smaller data set - are generating. It has been almost 2 years since The Financial Post published "Power Dumping" - much of this post is a rehash/update of the information Parker Gallant and I wrote on them.